The word “growler” can be used to describe a myriad of things. 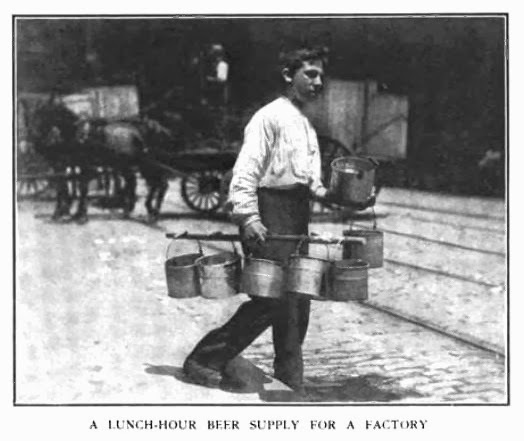 In the late 1800s and early 1900s, you couldn’t buy a six pack from the liquor store on your way home from work. People would either go to the pub, or carry the beer home in a small galvanized pail known as a “growler”. The name of the vessel used to carry the beer is rumored to have come from the sound that the carbonation made as it escaped through the lid of the pail. 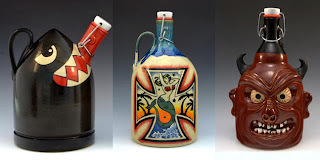 It wasn’t until 1989 that the modern growler, a large glass bottle, was contrive by Charlie and Ernie Otto of Otto Brother's Brewing Company in 1989. Today, growlers are commonly available from select specialty liquor stores. However, do a growler justice, the beer should come straight from the brewery. Although there are other sizes of growlers that exist, most can hold approximately 2L of beer. For me, 1.9 L is way too much to drink in one night – that’s the equivalent of more than 5 cans, or 4 pints of beer. Growlers are made for sharing. And although the beer in a growler should keep 7-10 days if refrigerated, I recommend to drink yours within 72 hours. I drink mine in 48, just to make sure it doesn’t go flat. The bottle itself costs only $5 or so, although there are now collectible growlers that are worth more. Most breweries charge about $10 to fill a growler, but others may charge more or less depending on the type of beer. It’s a little cheaper than a six pack, though the bottle can hold the equivalent of about 5 beers. However, you conserve a lot of energy by not having to recycle it once it becomes empty. Just think of all the bottles you won’t have to take to the depot after your party. 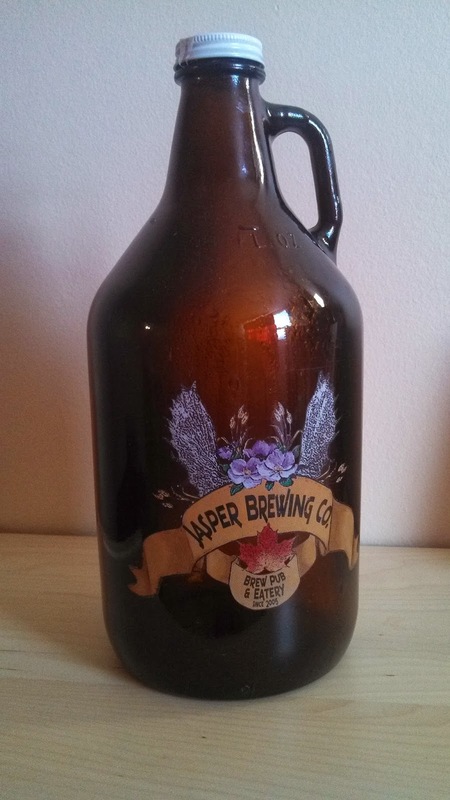 A friend of mine came back from Jasper with the best kind of souvenir for me - a growler of Blueberry Vanilla Ale from Jasper Brewing company. I drank most of it within 24 hours, but the remainder went flat. This is what I made with the leftovers. In a saucepan over medium heat, combine the blueberries with the ale, maple syrup, and lemon juice. 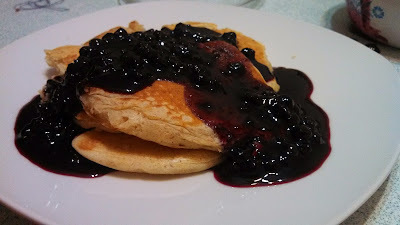 Bring blueberry mixture to a gentle boil, stirring frequently. In a small bowl, rapidly stir the cornstarch into 2 tbsp of cold water to form a slurry. Slowly add the corn starch slurry to the blueberries, stirring to combine. Simmer for about 5 minutes, until the sauce begins to thicken. Remove from heat and let cool for 5 minutes. Transfer to glass storage container. 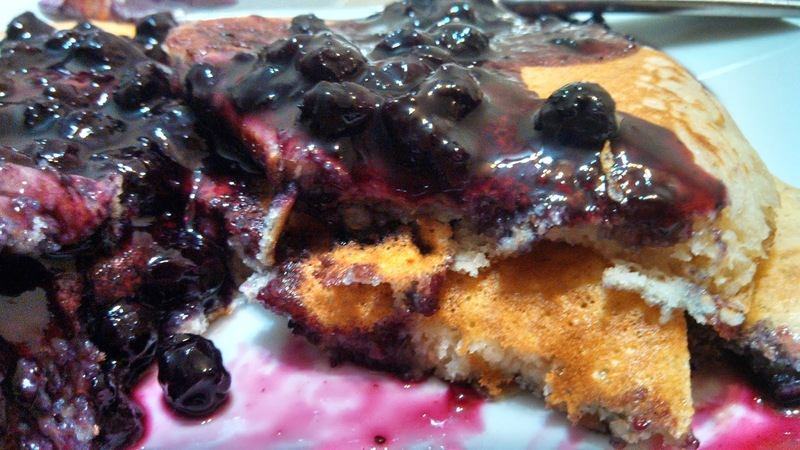 Serve cool or warmed over pancakes or waffles. In a large bowl, sift together the dry ingredients (flour, baking powder, salt and sugar). In a separate bowl, combine milk, beer, beaten egg, melted butter, and vanilla extract. Pour the egg mixture into the well and mix with a whisk until smooth. When there are no longer bubbling, it’s time to flip. Brown the other side and serve hot.